Easter egg baskets are a staple of Easter celebrations. Baskets can be colorful or shaped like animals. 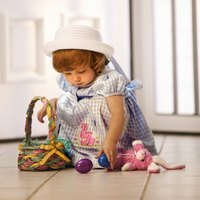 You can make an Easter egg-shaped basket at home with a few materials commonly found around the house. It is a simple craft project that kids can help create. Once completed, the basket can be filled with smaller Easter eggs and candy for an Easter surprise. Blow up a balloon to your desired size and tie the end in a knot. Fill a large microwaveable bowl with water and heat it in the microwave for 30 seconds. Add sugar to the water one cup at a time until the sugar will not dissolve anymore. Stir the sugar in to help it dissolve, and allow the mixture to cool. Dip a balloon into the mixture and turn it so all sides of the balloon are coated with the sugar mixture. Dip string into the mixture, and wrap the string onto the balloon in any direction you like. Make sure the string covers a majority of the balloon. The string should stay on the balloon by itself due to the sticky nature of the sugar water. Dip the balloon into the mixture again, and turn it so all of the string gets re-coated in sugar water. Tie a long string to the knotted end of the balloon, and suspend the balloon from a high place so it isn't touching anything. Place old newspapers under the balloon so sugar water doesn't end up on the floor. Wait for the balloon to dry completely, then pop the balloon. Take the deflated balloon out of the hardened string basket.